There are certain calls to news editors that prove irresistible. I imagine in this day and age of ratings and clicks mattering more than actual investigative reporting, nothing makes editors salivate more than the tale of a devastated family and the greedy, lazy, and/or incompetent veterinarian responsible for the death of a pet. It neatly checks all the boxes modern day news websites are looking for: sad family. Adorable pet. Terrible situation. Having fulfilled these requirements, the media happily narrates the story with appropriate gravitas and murmurings of “tragic, Jane, back to you for the weather” and then they go on with their lives while the veterinarian in question now is left with the angry mob to deal with. Who cares? It got a ton of clicks! Savaging a veterinarian who cannot legally or ethically defend themselves in public has become so common and so rote now that it doesn’t even surprise me any more. The latest happened in Greenville South Carolina, but the same old formula has been circulating for years. I should know; it happened to me too. When someone has lost their pet under sad circumstances and goes to the media, as the professional involved, you are in a terrible situation. We are not supposed to discuss our patients in a public setting. Pointing out that a grieving owner has some responsibility for what transpired is, even when it’s true, awfully callous. There’s just no winning. As a member of the public, it’s easy to feel outrage when you are presented with a one-sided story, but I’m begging you as someone who has been there, before you jump on the social media bandwagon and pillory yet another professional trying to do their job, to consider that there is probably another side to the story. In this recent case in South Carolina, a Pomeranian with no ID and no microchip presented with breathing difficulties to an emergency hospital; he was considered a stray, brought in by a Good Samaritan. The pet was euthanized. This is what we know. The hospital declined to comment, as is standard practice. All any of us have to go on is the owner’s story. My comments, as an emergency veterinarian who’s been in similar situations, follow. “Bridges says Meeka had a history of tracheal problems that were easily managed with ibuprofen and Benadryl, and believes the vet misdiagnosed her dog’s condition. Ibuprofen is not prescribed in veterinary medicine*. If the pet was being treated with that, his condition- whatever it was, as ‘slipped trachea’ is not a condition- was never accurately diagnosed or managed. In fact, ibuprofen toxicity is itself a common reason for ER visits. In an emergency situation where a good Samaritan brings in a pet with breathing difficulty (a true emergency), you are between a rock and a hard place as simple stabilization, never mind diagnostics, runs into the hundreds of dollars or more right out the gate. When you don’t have authorization from the owner and the pet is at risk of dying, you have to make very tough calls. The family says Meeka was euthanized just a few hours later. “You can’t be in that profession and not even have a second thought that this that could be a four year old’s puppy that you’re killing,” said Bridges. This is devastating. This poor dog. I wish I knew who he belonged to so I could talk to them. I hope there isn’t a little kid at home wondering if he is OK. I wish he had a chance. I wish he were not panicking while trying to breathe. I wish I had another choice. He must have been extremely sick. We don’t recommend tracheotomies or euthanize on presentation for a mild soft cough. According to the records shared by the owner, the pet was blue and couldn’t breathe without oxygen- conditions that, in emergency medicine, are as dire as it gets. If there’s any way to keep the pet safe and comfortable long enough to find the family, of course we will. We want our patients to live too. My heart is with the Bridges family, who is understandably devastated about Meeka’s death. I don’t blame them for looking for answers. Grieving people do that. I blame the reporter Brookley Cromer, may her stilettos always encounter dog poop, and the team at WISTV, for their laziness in amplifying a grieving family’s questions into implications of guilt instead of presenting the real, nuanced situation. Remember, a collar with tags would have resulted in a different ending. I wish the Bridges family peace. I wish the staff at Animal Emergency Clinic a bottle of wine. It’s just sad all around. *The news article has been updated to remove the name of the medication, but that is what was stated by the owner. This post is sponsored by State Farm®. Having good neighbors, as we all know, can be a roll of the dice. Our first week in our new home, we waved to people passing by, but no one said much. I wondered how we were ever going to get to know anyone. 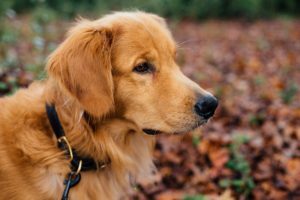 Later that week, my often-shy daughter barreled out the front door and down the driveway when she spotted a girl about her age walking her Golden Retriever down the street. “I have a Golden too!” my daughter said, and it was the start of a beautiful friendship. Over time, I got to know many of my neighbors: Rooney’s mom, Grizzly’s dad, Barkley’s twin boys- wonderful people, the whole lot, and the fact that they are also dog owners is a happy bonus as well as the reason I met them in the first place. Our friendships formed starting with our common interest in pets, but those friendships have also extended beyond just the dog park. Which begs the question: is my dog helping me become a better neighbor, or am I just imagining things? Are Pet Owners Better Neighbors? Earlier this year, State Farm released The State of Neighbors Survey to understand what is happening in our neighborhoods. I learned, for example, that I fall in the third of people who are embarrassed that we don’t know all our neighbor’s names (though I can for sure tell you who their dogs are.) I also learned that it’s not just my imagination: pet owners really are more active in their neighborhoods. I’m sure we can all come up with our own personalized list of neighborly characteristics: doesn’t practice the tuba at 10 pm, doesn’t use your wifi without asking. One thing is clear from the State Farm survey: people long to be connected to their community and their neighbors. And clearly, pet owners do that very well. So yes, while finding good neighbors can be a roll of the dice, having a pet in your corner can help even out the odds. To help you get started, we’re giving away a Bark Party gift basket to get your party off on the right foot! To enter, just comment below with your name and how your dog has helped you be a good neighbor- entries are collected using the Rafflecopter app below so be sure to enter there! Terms: US only, one entry per person. Contest ends midnight PST, 11/16/16. Winner will be chosen at random and notified via email. If winner does not respond within 48 hours, an alternate will be selected. Good luck! I’m so sick of being reminded not to let my dogs eat chocolate on Halloween! Don’t we all know this by now? 1) People eat chocolate and chocolate-containing foods all year long, so I don’t think there’s any point focusing on chocolate only at Halloween, on one day out of 365. [To my mind, it’s sort of like expressing love on Mother’s Day – shouldn’t you be showing affection and appreciation to your mother every day of the year?] Shouldn’t you always be parking your 78% dark chocolate bar in the fridge or your underwear drawer, out of canine reach? 2) A vast number of so-called chocolate sweets, cakes and cookies are actually “chocolate-flavored” and contain barely a trace of the actual cocoa, which is what isn’t good for dogs. So if you’re not sharing with your dogs it’s just plain selfish (although clearly it’s better animal care to be offering a nice dog-appropriate piece of carrot or a freeze-dried Liv-a-Little cube of salmon). Pets will do best when excluded from all the comings-and-goings. The unusual sights and sounds can be dsiturbing to them. Put your dog in a room behind closed doors when Halloween parties are underway or you’re expecting trick-or-treaters. Dogs can be startled, frightened or reactive to people in costumes and might react defensively or offensively to their presence. Put your cat in a closed off room with a cat tree to escape up to and/or a safe hiding place. With the door opening and closing, there’s the chance of a pet being disoriented or fearful and running out while you’re distracted with the celebrations. To remove the risk of him getting lost, always – not just on Hallo0ween! – make sure your pet is properly identified with microchip, collar and ID tag. Keep glow sticks and glow jewelry away from your pets. Although the liquid in these products may not actually be toxic, it tastes horrible and can sicken your dog or cat. If you plan to put a costume on your dog, buy it beforehand and get her used to it before Halloween. Make sure it fits comfortably and doesn’t interfere with your pet’s sight, hearing, breathing, or movement. Don’t leave your dog unsupervised while wearing a costume, which often have pieces that can be chewed off. Keep lit candles and jack-o-lanterns out of reach of pets, especially cats who might find them an interesting interactive exhibit. This is both for the safety of the pets and of your family, as a tipped over candle can cause a tragedy. 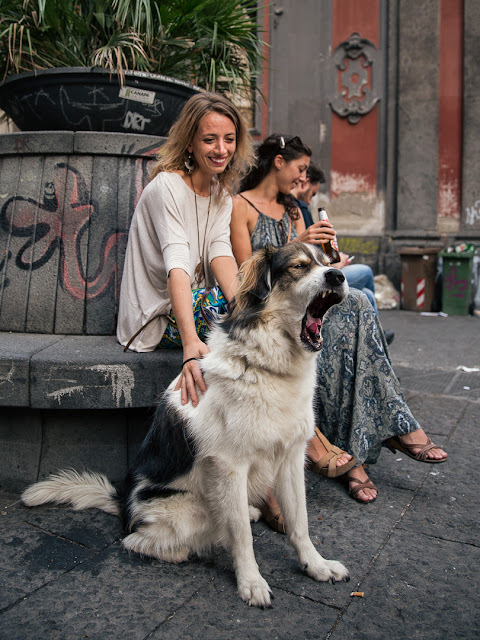 A big yawn in Naples.